Does your green cart look like this when you place it curbside for collection? If so, your green cart will be tagged and left uncollected by your area’s municipal curbside collector. A collector is unable to tip and empty green carts that contain too much leaf and yard material. 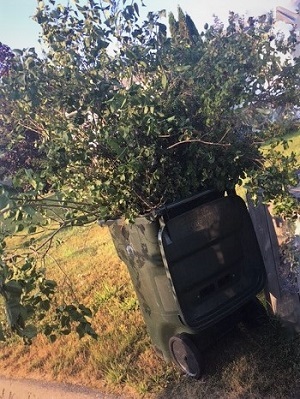 • Please do not overfill your green cart with trees and branches. The lid of your green cart must be closed for emptying to take place. If you have a large amount of leaf and yard waste to dispose of, you can bring it to one of the Solid Waste Department’s Seasonal Leaf and Yard Drop of Sites open one day a week in North Sydney, New Waterford or Glace Bay. • Please make sure the serial number on the front of your green cart is facing the road/street. • Only one green cart per civic address will be emptied on collection day. • Sods are not accepted in the green cart for collection. Sods must be taken to the Waste Management Facility on Spar Road in Sydney for disposal. During the summer months, green carts can become smelly and attract all kinds of interesting wildlife. Although it will be difficult to avoid a lot of nuisances associated with using your green cart, there are steps that can be taken to reduce the intensity of these experiences. You are encouraged to place your green cart curbside for emptying each week on your collection day. Maggots are a natural occurence once the temperatures begin to warm up. Most green carts will attract maggots at some point during warmer temperatures. Maggots are difficult to avoid especially during hotter temperatures. Spray the sides of the green cart, vents, lid and grate with vinegar. You can also spray vinegar directly on the maggots which will cause them to slide down the side of the green cart and become mixed in with the contents of the cart. Sprinkle salt on top of any food waste or table scraps that you place inside your green cart. This will help prevent maggots. Sprinkle baking soda on the lid, sides, grate and bottom of your green cart following weekly collection. Clean your green cart using a mild dish detergent or with vinegar and water following collection. Freeze smelly food scraps like lobster shells, clam shells, crab shells, fish, meat or other food scraps until your collection day. Keep the lid of your green cart closed at all times except when placing materials inside. Cover exposed food waste and table scraps with newsprint or soiled paper towels once you have emptied it inside your green cart. You can also wrap the food waste and table scraps in sheets of newsprint or soiled paper towel before placing inside your green cart. Store your green cart in a shady area out of the direct sunlight. Place your green cart curbside for weekly collection. The longer the materials sit and decompose inside your green cart, increases the liklihood that maggots will appear. Rodents Avoid storing your green cart near high grass, shrubs, fences, decks, wood piles or other structures that can act as a hiding spot for rodents. Store your green cart away from your home. If you notice holes or other damage to your green cart, please contact the Waste Management Hotline to have your civic address added to the department's green cart repair list. Visit http://healthycanadians.gc.ca/product-safety-securite-produits/pest-control-products-produits-antiparasitaires/pesticides/tips-conseils/index-eng.php for other tips. A green cart is going to produce odours especially during the warmer months. Odours will become more intensified during periods of heat. Place your green cart curbside for weekly collection. Store your green cart in an area that is out of the direct sunlight. A shady area is ideal. Move your green cart further away from your home to create distance. Wash and/or rinse your green cart following weekly collection to remove any leftover residue that has stuck to the sides or bottom of your green cart. Cover exposed food waste and table scraps by wrapping it in newsprint or soiled paper towels before placing inside your green cart. Freeze smelly foods like lobster shells, crab shells, clams, fish or other meat scraps in your freezer (if you have space) until your collection day. Keep the lid of your green cart closed at all times when your are not placing food waste inside green cart. If you decide to clean out your refrigerator, freezer or cubboards, choose a day that is close to your collection day so food waste does not have a chance to sit too long inside your green cart between collections. Following weekly collection, line the bottom of your green cart with used paper towels and or sheets of newsprint to capture any moisture, dampness or liquids that evaporate from food waste as it decomposes. The bottom of a pizza box or sheet of cardboard is another soiled paper item that can be used to capture or catch any liquids that form. Avoid placing large amounts of grass clippings inside your green cart for disposal. Once grass becomes damp or wet it sticks to the sides or bottom of green cart, underneath and on top of the grate and can be difficult to empty on collection day. Decaying grass can lead to intensified odours when left too long inside your green cart. Avoid placing large amounts of leaves in your green cart for disposal. Once leaves become damp or wet, they have a tendency to stick to the sides and bottom of green cart, underneath and on top of the grate and can be difficult to empty on collection day. Decaying leaves can lead to intensified odours when left too long inside your green cart. Food waste remains inside green cart following collection day. Sometimes it may appear the green cart was not emptied depending on the amount of residue remaining inside following collection. This is a common complaint. It is not uncommon to have leftover residue remain inside the green cart following collection Wet, damp or moist food waste can stick to the inside of green cart and remain following collection. To reduce the likelihood of this happening, wrap food waste inside soiled paper towels or in sheets of newsprint. You can also place food waste inside of an empty cereal, cracker or cookie box before placing it inside green cart. Empty food waste near the center of green cart instead of close to the sides of cart. Line the bottom of the green cart with sheets of newsprint, soiled paper towels or the bottom of a pizza box to capture loose food waste. Residents who have questions about Waste Management in CBRM are encouraged to contact the Waste Management Hotline at (902) 567-1337. Educators are available to respond to inquiries from 8:30 am to 4:00 pm Monday to Friday. Food waste remains inside green cart once it has been emptied. Sometimes, it may appear as if the green cart was not emptied following your collection depending on the amount of residue that remains inside green cart.